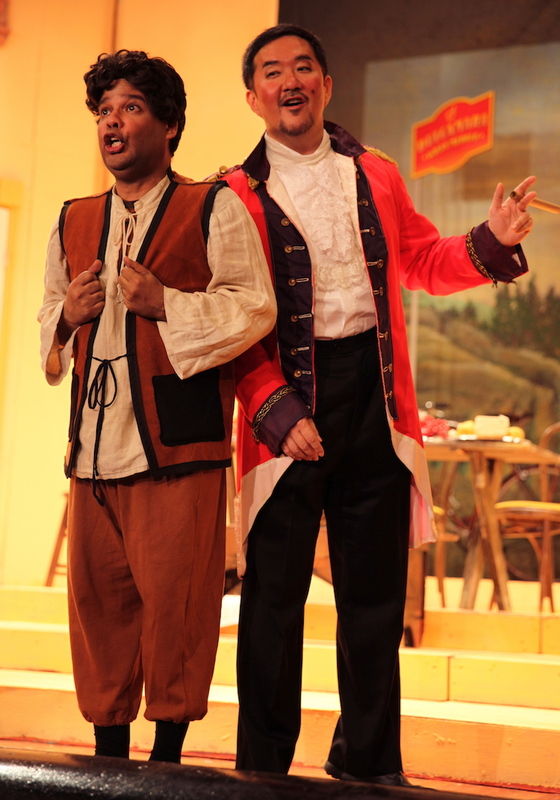 On the afternoon of Saturday, May 20th, the Regina Opera concluded its 47th season with the charming comedy L’Elisir d’Amore. One more performance with alternate cast the next day! The great composer Gaetano Donizetti (1797-1848) wrote many tragedies such as Lucia di Lammermoor, but his comedies La fille du Regiment, Don Pasquale and L’Elisir d’Amore are still a source of great delight. Donizetti was a prolific composer and a master of melody. The librettist was Italian poet and scholar Felice Romani who wrote many librettos for composers Donizetti and Bellini. 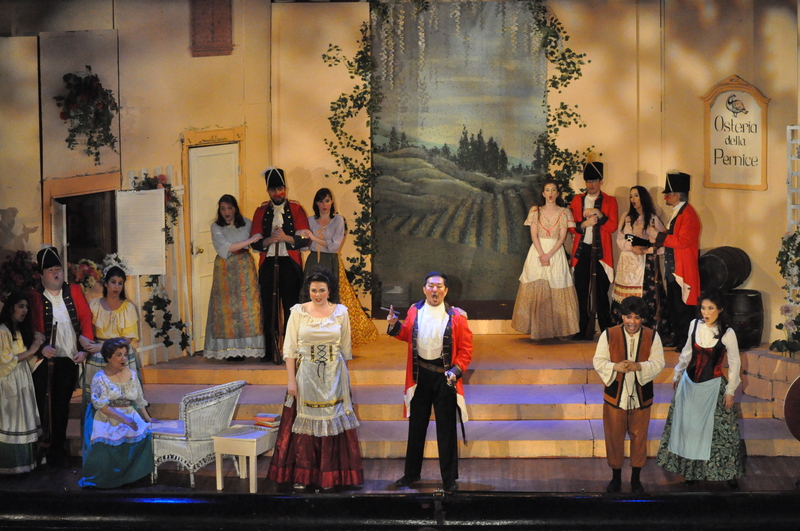 L’Elisir d’Amore premiered in Milan on May 12, 1832 and has been a favorite ever since. On a sad note, on December 11, 1920, the great tenor Enrico Caruso sang Nemorino at the Brooklyn Academy of Music. (BAM) He suffered a throat hemorrhage and the curtain came down after the first act. Incredibly Caruso sang three times more at the Metropolitan Opera in great pain. His last performance was in La Juive the following December 24th. He died on August 2, 1921 at the age 48, after a lingering illness. At Regina Opera, Principal conductor Maestro Gregory Ortega stepped up to the podium and the performance began. 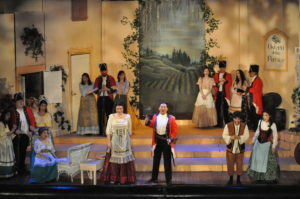 After the overture, the curtain rose to reveal a bright rustic inn and floral scene with Adina reading a book and a group of peasants nearby. Nemorino lovingly gazed at Adina and sang “Quanto è bella, quanto è cara” about how beautiful and how dear she is. 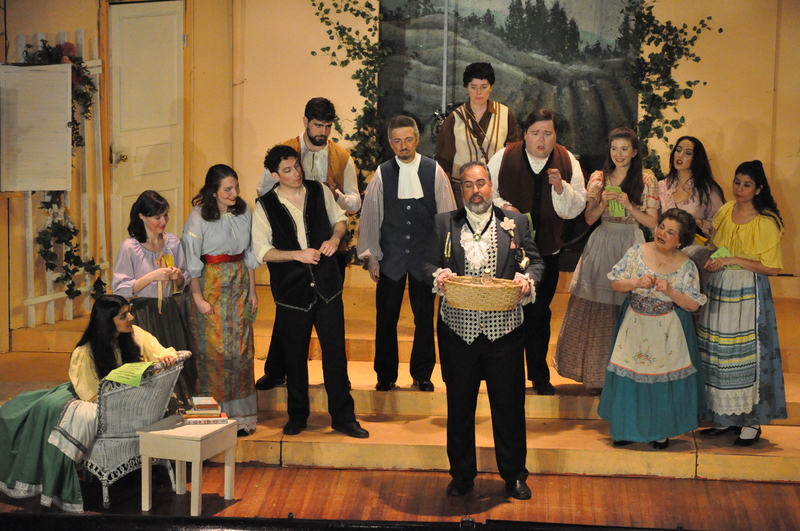 Lyric tenor Ivan Rivera, was the Nemorino for this performance. Mr. Rivera, born in Puerto Rico, has an endearing boyish appearance, is very mobile and resembles a young Cantinflas. (A brilliant Mexican film comedian) Rivera was perfect as the runt of the litter, the foil and fool, his head besot with thoughts of Adina who seemed to be totally out of his reach. He is the gnat that one slaps, a speck of dust in the eye of his unattainable beloved. Nemorino’s singing of “Quanto è bella” showed a somewhat different approach to singing, almost between his teeth-but the sound was that of a true tenore di grazie, of old, with a haunting vibrato and a full top. His interplay with Adina was most affecting and his singing of the great aria “Una furtiva lagrima” was one of the highlights of the performance. His diminuendos were exceptional, his spinning of the tone and heartfelt passages were moving. Rivera’s final cadenza, with fading and diminishing of the tone, was a marvel and his swelling of the note just before the conclusion was magical. Rivera’s comic acting with the so called “elixir” was great fun, his interplay with Belcore was like Lt. Colombo-always showing up and bothering, cloying and annoying! The finale, where he finally wins Adina’s heart, was absolute triumph and joy! A wonderful performance! Adina, a wealthy young lady, was enchantingly played by Hannah Stone whose attractive persona, lovely soprano and understated and subtle behavior made for an enchanting Adina. Her roulades, cadenzas and stratospheric high notes throughout the performance made her the perfect match for her heartsick swain. Ms. Stone’s describing the story of Tristan and Isolde’s magic love potion to the peasants was dream worthy. Her sweet saucy soprano, was perfect in this role. 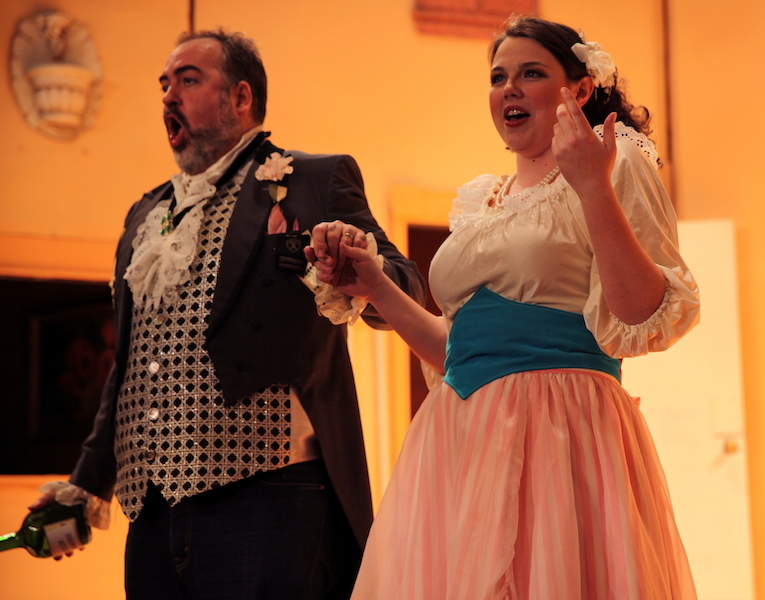 There was exuberance as she hit her high notes with triumph in her duet with Dulcamara, “The Gondoliera and the Senator”, which was sung with delicious whimsy and abandon! Ms. Stone’s stunning singing of “Prendi, per me sei libero” with its cadenzas and vocal fireworks in the second act showed her artful best. It was a “tour de force” that was dazzling! The finale with she and Nemorino finally kissing as one made for much happiness. 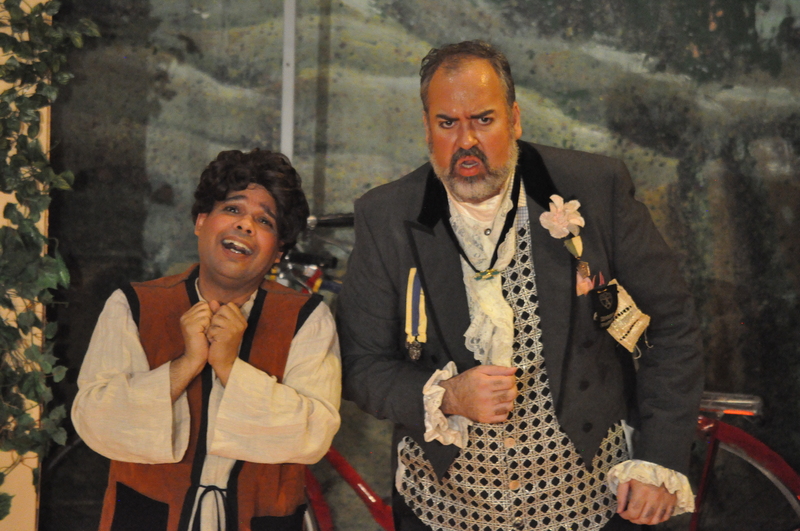 Dulcamara, a traveling “doctor”, was in the able hands of Luis Alvarado, whose generous basso-buffo ensured us of a strong performance. (I am always amazed at all the “Dulcamara’s” selling their magical cures on the Internet). After much pomp and trumpetry with descriptions of a golden coach, Dr. Dulcamara arrived with his assistant, riding a red bicycle! I recall at the old Met, the great 300 pound basso-buffo (later movie star) Salvatore Baccaloni, arriving in a balloon! Dulcamara’s singing of “Udite, udite o rustici” was sung with relish as he describes the various “cures” of his “magic elixir” warts, gone! widows rejuvenated! humps? gone! rheumatism, banished! A miracle elixir (cheap Bordeaux wine). Alvarado’s comical singing of “The Gondoliera and the Senator,” with Adina at her “wedding” to Sergeant Belcore,” Io son ricco e tu sei bella” was most amusing. Alvarado was a very noteworthy Dulcamara and his “patter singing” was first rate. The finale with his singing “Ei corregge ogni difetto” with chorus and company was an absolute delight. Sharon Cheng was a most charming Giannetta with a piquant pretty soprano and a gleeful countenance. Sarah Barringer was the “quicker picker upper” as the erstwhile assistant to Dr. Dulcamara. The chorus was in excellent form and I loved when they crossed themselves perpetually and with some glee, when they heard that Nemorino’s uncle had passed away and left him a fortune. Beloved chorister Cathy Greco’s crossing herself with such wide eyed sincerity with the others was notable. 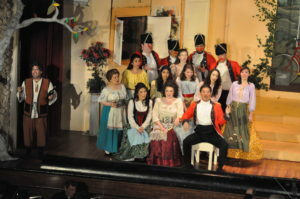 The colorful ensemble consisted of Valentine Baron, Susanna Booth, Justine D’Souza, Thomas Geib, Wayne Olsen, Raffaele Rosato, Samantha DiCapio and Cassandra Santiago. The costumes by Marcia C. Kresge were perfect-from Adina’s rustic and lovely dresses to the peasants garb, Dr. Dulcamara’s pompous outfit, Nemorino’s somewhat threadbare outfits, and the dazzling red uniforms of Sergeant Belcore and his troop. The Principal Conductor and Music Director, the ingenious Maestro Gregory Ortega led a strong unified and glowing performance. The 34 excellent musicians followed his invigorating beat which was truly blended to this joyous tuneful score by Gaetano Donizetti. Kudos to Jonathon Nelson on the keyboard for the parlando passages. The trumpet heralding the arrival of Dr. Dulcamara was adroitly played by Hugh Ash. Sam Themer and Milan Rakic’s make up was flawless and Linda Cantoni’s super titles were invaluable. The sets were beautiful and rustic, with garlands of flowers, overhanging vines, an open doorway with verdant outside, the intimacy of a small taverna and an elaborate wedding feast replete with food and fun. The versatile Wayne Olsen’s set graphics and principal flutist and set artist Richard Paratley’s painted backdrop and other artistic touches were truly admirable. The mournful bassoon solo by Stephen Rudman in “Una furtive lagrima” deserves special mention. Lastly, the one who infused this performance of L’Elisir d’amore with a special life is Stage Director and Set Designer Linda Lehr. Ms. Lehr’s balancing the various protagonists, freezing of images, making the action so wonderfully fluid and special whimsical touches from Belcore’s blustering to Nemorino’s “no room at the inn” gloom and doom and packaging it all into a fine surprise with a perfect gift wrap is a miracle. Dr. Dulcamara’s arrival after so much heralding, not in a golden coach but instead on a red bicycle was like the midget clowns at the circus following the giants. We thank the indefatigable Francine Garber-Cohen, Producer and President, Joe Delfausse, Marlena Ventimiglia, Elena Jannicelli-Sandella and all the volunteers for always greeting one and all as they arrive for an afternoon of splendid opera at Brooklyn’s “crown jewel,” The Regina Opera. Afterwards we reenacted the sumptuous dinner scene by dining at La Casa Vieja, a Mexican restaurant nearby where Lourdes Peña and company hosted us very well indeed! See you next season – Regina’s 48th! THANKS TO NINO TO KEEP US SO WELL INFORMED…………..COMM. ALDO MANCUSI AND ALL OF US AT THE ENRICO CARUSO MUSEUM OF AMERICA.